Leave the Nest was a game originally developed for HTC Vive then later ported to PlayStation VR. My job with this game was to design and implement a new main menu system to coincide with our release onto the PSVR platform. With the player interface being a VR headset, there was little precedence for how a good menu system should be implemented. With this in mind my design was focused on physicality, meaning all menus and options for the player would take up physical space, instead of residing on a flat plane. CodeName Kansas was a live stage production involving several actors on stage performing a play with a real-time CGI backdrop to reinforce the interactions between characters. my role in this production was to develop the Particle effects representing magic, as well as create a grey box of the User Interface used by the Director to trigger the many real time events. This Project was a Study i did to gain a more solid foundation in combining mathematics with art. These images were created by using a 3D Asset such as a cube or sphere and populating a space either in a grid or a fractal, then animating the points with rotations or waves. 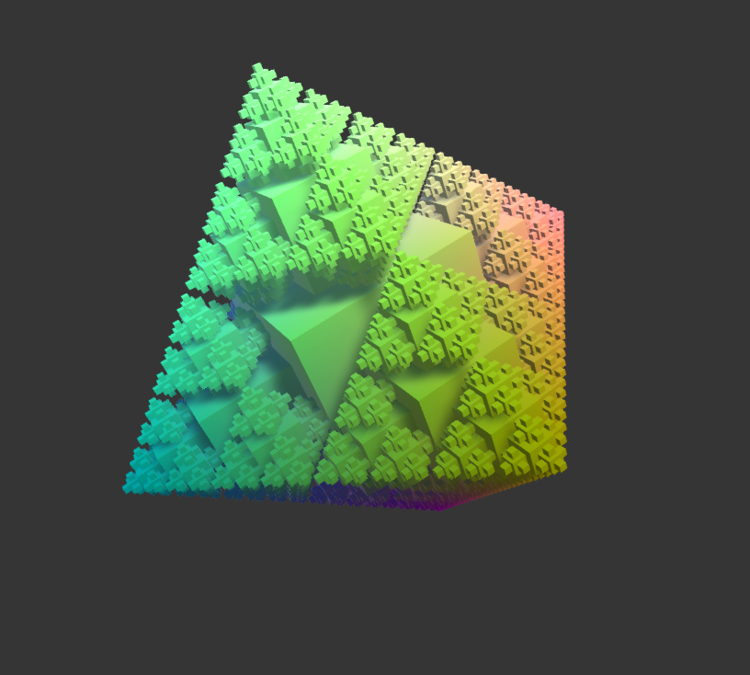 Particles were then added to support the fractals for visual effect. This Model was a study done to better understand modular design. This building, modeled after an asset found in The Elder Scrolls Skyrim, was constructed in simple pieces and duplicated to minimize the work necessary to model, UV and texture. these pieces can also be reused to create many diverse buildings in a similar style. This Image was a study done to understand how to produce a more realistic image. This scene was constructed using Image-Based Lighting. Several renders were taken of this image to capture color, lighting, depth of field, and ambient occlusion seperately, then overlayed atop each other to produce the desired result. This Scene was a study done to better understand the asset pipeline from zBrush, to Maya, to Substace, and finally into Unreal Engine. I then placed the assets into an environment, and added lighting for more visual appeal. This Scene was created in collaboration with several other first year artists to demonstrate a fundamental understanding of modeling assets and compositing a visually appealing environment. my job in this render was to create the lighting, Glowing willow tree leaves, and the blue particles. We decided to render the scene in a dark setting with lots of trees to reduce the space we needed to fill. This character was modeled after the fictional character Lara Croft. she was created as a study of human anatomy, character rigging and texturing. Originally modeled in zBrush, she was retopologised manually in Maya, textured in Substance, and rendered in real time in Unity Game engine. This Project was graded on her likeness to human form, topology, textures, and animation. This character was modeled after the fictional character Dare Devil. He was created as a study of the human anatomy. This Project was graded on his likeness to natural human muscle structure, his clean topology, and his texture mapping.